Simple Ways to Detox your Skin For Autumn. — Karen guides us through an internal and external cleanse to prepare for the cooler months ahead. Sometimes, if the rest of your body is overwhelmed or sluggish, your skin may develop issues to compensate, and try to get rid of impurities. You may notice this because you will be slightly smellier than usual, have fatigue or fluid retention or get more pimples or blackheads. So, let’s get started. Always use natural products or your body will have to somehow detox the chemicals anyway – which defeats the purpose of a detox. *As much as possible. Let your skin breathe. Once a week – gently exfoliate your skin with a natural exfoliant. Our favourite DIY exfoliant couldn’t be simpler: Coffee granules (preferably finely ground, not hard to get hold of in Melbourne! ), a drizzle of olive oil, squeeze of lemon juice. Make a paste and rub gently on the skin for one minute. Rinse with warm water. Soak a flannel in warm water and repeatedly press and hold onto your skin. The steam and the heat will gently open your pores and make it easier for the mask (next step) to penetrate and remove impurities. Apply your mud face mask liberally and leave for 10 minutes. A mud mask will pull impurities and waste materials out of your skin, unclog pores, and revitalise dull skin. We love Acure’s Brightening Mask. Read Karen’s favourite DIY face mask recipe in clearing out clogged pores. 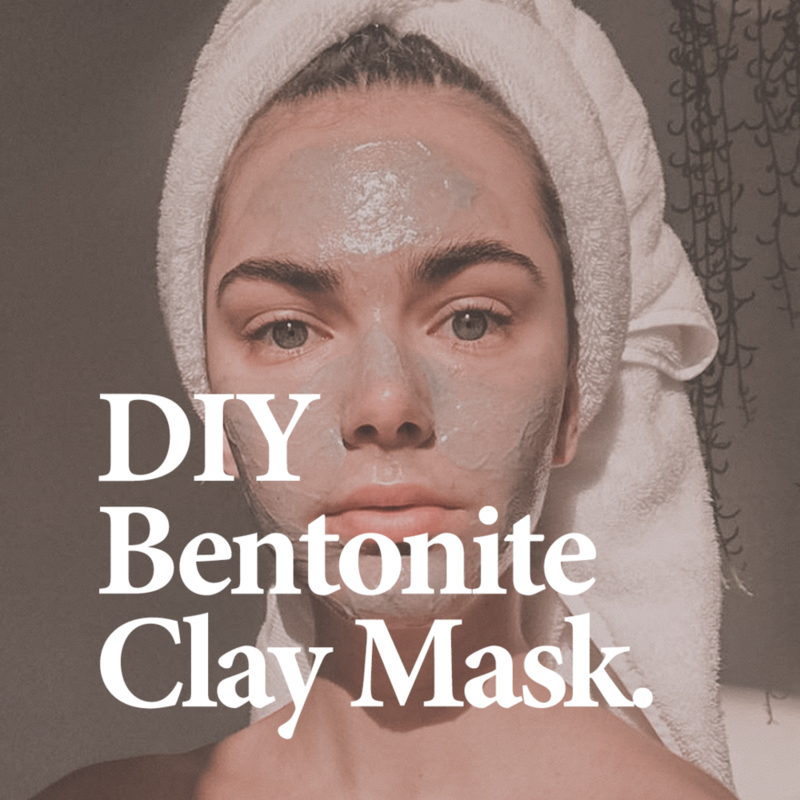 Or make your own using a combination of bentonite clay and charcoal – a perfect combo to draw out impurities Mix 1 TBS bentonite clay and 1 TBS charcoal powder with a little water and apply a thick layer to the face and neck. Wait, rinse and pat dry. Bearing in mind your skin will be sensitive due to the exfoliant, it’s important to use a facial oil plus moisturiser to rebuild the skins natural barrier of protection. Noema recommends Rosehip or Argan oil, or a mixture of both followed by a luxurious natural moisturiser. Retinol is a wonderful skin healer and rejuvenator at a very deep level, and can be especially effective to help revers e the signs of sun-damaged skin. We recommend Sunday Riley’s Sleeping Night Oil. At least 1.5L /day. This is an easy one that we all forget. Without enough water fine lines are exaggerated and the skin is not able to flush out toxic wastes. Filtered water is even better, even if it’s only from a bench-top jug like Gentoo. To detoxify the skin internally you need to make sure your other ‘organs of elimination’ are running optimally, so that toxins don’t recirculate and come out of your skin. We’re talking gut, liver lymphatics and kidneys. A good gentle way to do this is with herbal teas that nourish these organs: Dandelion root and leaves, nettle, calendula and burdock root. See our comprehensive guide for a full list of foods that can nourish and revitalise the skin. Going easy on the alcohol and sugar and eating foods that nourish your liver will mean that your liver can do its job properly and wont rely on your skin. Try these delicious liver detox soups. Constipation is major cause for clogged skin, and it’s easy to imagine why. Make sure you are drinking enough water, having enough fibre and feeling relaxed enough to go to the toilet. Try introducing a good probiotic to your daily routine, plus fibre rich foods like psyllium husk, flaxseed sand chia to make sure you’re going daily. The lymphatic system is a network much like the blood circulatory system. However works much like the bodies garbage disposal system. It removes toxins, helps carry immune cells and acts like a blood filter via the spleen. This system doesn’t have a pump like the heart so it relies on movement to work properly. Therefore dry brushing daily as well as exercise and movement is important to get the lymphatic system eliminating well – so your skin doesn’t have to. Avoiding dairy, wheat gluten and sugar for one month if you are willing to go all the way! Dairy especially, it can play havoc with the skin. Include foods rich in vitamin C like citrus, red capsicum and berries. Don’t forget your beauty sleep. Studies have shown that not enough sleep your skin’s fluid balance and ability to repair is significantly reduced. And remember: Autumn is a windy season so you may want to use an extra external barrier on your skin for protection. Using a combination of Rosehip oil and Shea Butter is perfect for Autumn and will not clog your skin. See our other favourite skincare ingredients here. Do you have any practices that you do to prepare for a new season? What are your favourite products to help you transition into the cooler months?